In Justin Bieber's "Baby" video, we saw him hanging with celebrity pals like Drake and Ludacris while winning back his girl with his killer bowling skills. But in his latest clip, for "Never Let You Go," Bieber is seen hanging out in the catacombs of Bahamian aquariums, surrounded by adorable teenage girls gawking at the marine life. In this new clip, Bieber is seen performing on the beach and frolicking with Hurd. Bieber is definitely growing up a lot in this video — sharing near-kisses, touching and nuzzling with his girl. Shots of the pair in silhouette holding hands play into the video's plot of two young teens falling in love in a very exotic locale. 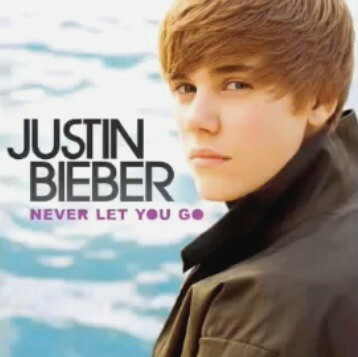 "Never Let You Go" is a song performed by Canadian recording artist Justin Bieber. The track was written by Bieber and also co-written and produced by production duo Johnta Austin and Bryan-Michael Cox. It was originally released as the first digital-only single from latter half of Bieber's debut album, My World 2.0 on March 2, 2010. The song debuted and peaked at numbers fourteen and twenty one, in Canada and the United States, respectively. The accompanying music video features Bieber at the Atlantis Resort in the Bahamas features scenes at the resort, an aquarium, and on the coast. It is unknown if the song will be released as a single, as "Somebody to Love" is set to impact radio as the second single.